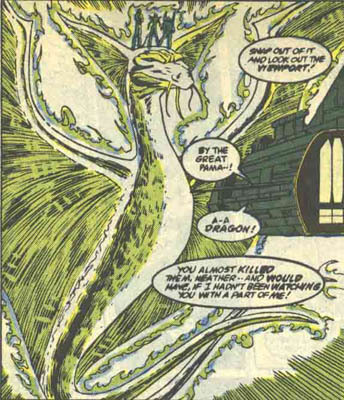 Powers/Abilities: Sundragon possesses cosmic powers which include flight, the ability to survive in space without need for oxygen, cosmic senses which can sense the distress of others, telepathy, various energy manipulation powers, and the ability to create a giant dragon composed of energy, which she sometimes uses to travel through space. History: (Solo Avengers#16/2)- Pamela Douglas suddenly found herself suffering from unexplained outbursts, as she scribbled "hate them" repeatedly on notepads, and flew into fits of anger for no apparent reason. 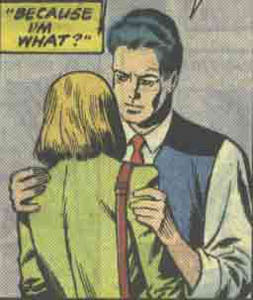 She also began to fear that her boyfriend Tom didn't love her because she was going mad. One night, she went into the washroom and shaved off all of her hair. After this, she was placed under the care of a doctor, who advised her to take a vacation, believing her to be suffering from stress. However, when she saw a billboard of a fetus while driving her car, she crashed it. Pamela was now convinced that her irrational behavior was a result of her being pregnant, but the doctor's tests came back negative. Her paranoia continued, until one night she was attacked in her apartment by a giant hand. She ran from the building into the streets, where she was contacted telepathically by Heather Douglas, her cousin. 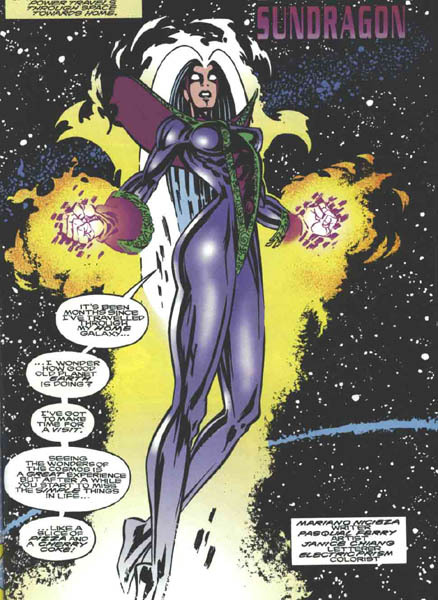 Heather explained to Pamela that she had been the super-hero Moondragon, until the influence of the Dragon of the Moon corrupted her, and her body was destroyed battling the Defenders. The Eternals of Titan had cloned a new body for Heather on Titan, but Heather's soul had hidden itself within Pamela. Heather was now conscious enough to speak with Pamela, and directed her to enter her ship, Sensia II, which would bring her to Titan. However, the entity responsible for the attack on Pamela returned, and proved to be Isaac Christians, formerly Moondragon's ally Gargoyle, his soul now confined to a crystal. Heather, speaking through Pamela, convinced Isaac to halt his attack and come with them to Titan, in the hopes that they could find a new life for him as well. He agreed, and Pamela placed the crystal around her neck. (Solo Avengers#18/2)- Pamela enjoyed herself on Titan, often playing trivia games with their computer ISAAC, and games of chess with Mentor. She also learned more about Heather from her as her new body continued to grow. Pamela was attracted to the Eternal Demeityr, but Heather didn't approve of their relationship from the start. On the day that Heather's new body was ready to be released, the Priests of Shao-Lom attempted to claim Heather for their monastary, but Heather and Pamela both refused, and were determined to depart Titan. As they set off into space, they were trapped in the tractor beam of a vessel operated by the Dance. Pamela found herself and Heather manipulated by the Dance in an attempt to use them in their bizarre experiments, but with Heather's prodding, Pamela was able to access her own innate psychic powers, and set them free. She also caused Demeityr to appear before them, and the Dance allowed them all to depart their ship. (Solo Avengers#20/2)- Pamela, Heather, Isaac Christians and Demeityr met with Cloud, a reunion that went sour when Moondragon erupted in a fit of rage over being trapped in her still-growing new body. As Pamela and Demeityr set off to their quarters, Moondragon attacked them psychically, and tried to take Demeityr away from Pamela. When Pamela and Isaac confronted her, Moondragon cast all three of them out of the ship, to die in space. Pamela fell into a sun, but Cloud saved all three of them, and fully awakened Pamela's powers. Pamela adopted the new identity of Sundragon, having taken the power of a sun. The three of them forgave Moondragon, then set off to explore space together. (Cosmic Powers Unlimited#2/3)- When Colony World#827 of the Rigellians was threatened by a vessel of the Dance, Sundragon came to their defense. She attempted to halt the Dance with a show of force, but they responded by knocking her aside. Sundragon responded with another attack which destroyed the Rigellian's computer systems, but did little to harm the Dance. She finally learned that the Dance's intention all along had been to prevent a comet from striking another planet, and destroyed the comet for the Dance. Exploring the planet, she found it barren of life, but as a Riegellian Recorder noted, it might one day have a grand destiny to play in the universe. Comments: Created by Peter B. Gillis, Don Perlin and Jack Abel. The opening chapter of Pamela's tale covered familiar ground for this Peter B. Gillis fan-- it reminded me a lot of his Warp stories, particularly the mental possession and seeming-madness elements. Tom was Pamela Douglas' live-in boyfriend in Soho, and was a yuppie. He attempted to be supportive of her as she became possessed by Moondragon, but had no hope of comprehending what was going on.